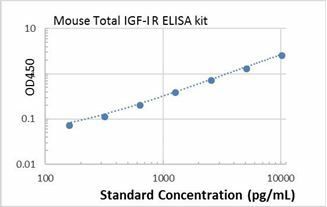 Specificity This assay has high sensitivity and excellent specificity for Mouse Total IGF-I R. No significant cross-reactivity or Mouse Total IGF-I R and analogues was observed. 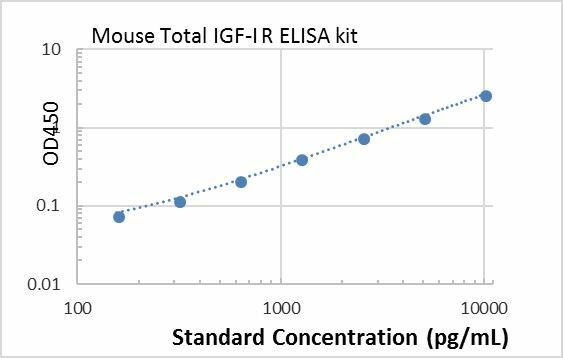 Typical Data ELISA: Mouse Total IGF-I R ELISA Kit (Colorimetric) These standard curves are provided for demonstration only. A standard curve should be generated for each set of samples assayed. Background The insulin-like growth factor 1 (IGF-1) receptor is a protein found on the surface of human cells. It is a transmembrane receptor that is activated by a hormone called insulin-like growth factor 1 (IGF-1) and by a related hormone called IGF-2. It belongs to the large class of tyrosine kinase receptors. This receptor mediates the effects of IGF-1, which is a polypeptide protein hormone similar in molecular structure to insulin. IGF-1 plays an important role in growth and continues to have anabolic effects in adults – meaning that it can induce hypertrophy of skeletal muscle and other target tissues. Mice lacking the IGF-1 receptor die late in development, and show a dramatic reduction in body mass, testifying to the strong growth-promoting effect of this receptor. Mice carrying only one functional copy of IGF-1R are normal, but exhibit a ~15% decrease in body mass.